The Kuang Si Falls, sometimes spelled Kuang Xi or known as Tat Kuang Si Waterfalls, is a three tier waterfall about 29 kilometres (18 mi) south of Luang Prabang. 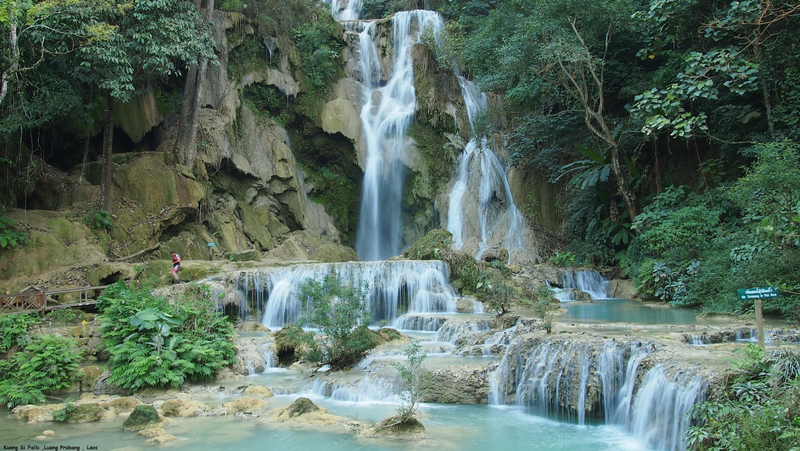 These waterfalls are a favourite side trip for tourists in Luang Prabang. The falls begin in shallow pools atop a steep hillside. These lead to the main fall with a 60 metres (200 ft) cascade. They are accessed via a trail to a left of the falls. The water collects in turquoise blue pools as it flows downstream. The many cascades that result are typical of travertine waterfalls.